Has there ever been a time you wished you could have it all? You can! 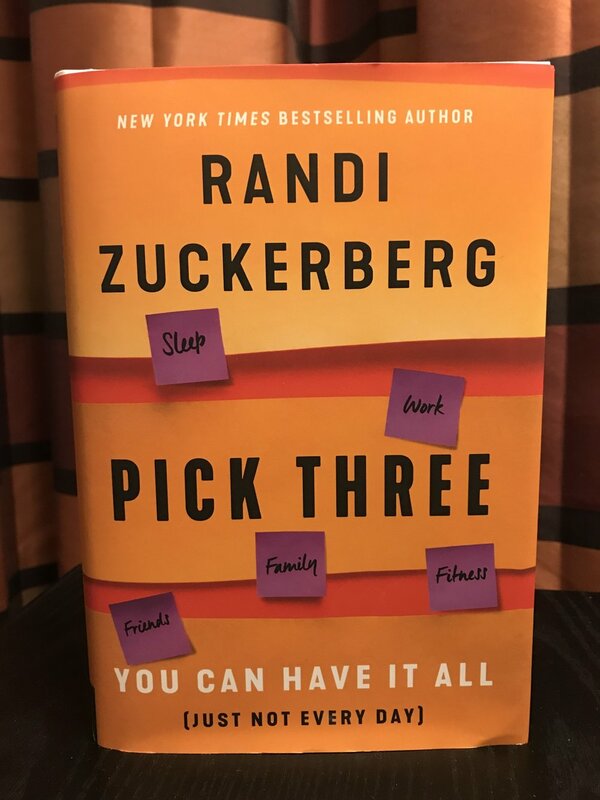 I just read Pick Three by Randi Zuckerberg @randizuckerberg and the entire premise is that You Can Have It All [Just Not Every Day]. Brilliant! Deep sigh of relief – we don’t have to be perfect. In fact, it’s okay to not be. Randi gives guidance about how to live a lopsided lifestyle. You pick three things a day to focus on. The goal is to do those three things well. Over time the lopsidedness should even out so you end up living a well-rounded lifestyle. I really wish I had come across Randi’s book a couple of years ago. You might remember I recently shared that I had gone through a burnout phase. I was overwhelmed with everything on my plate and I felt like I had to fit it in every day. During my burnout phase, my days consisted of work + school + fitness (look at that, I’m at three things already) + friends/family (does calling during my drive times count?). Notice sleep really didn’t make the cut? Between homework and getting up at 3:30 a.m. to make it to the gym, my days seemed like an endless merry-go-round. One day I just couldn’t do it anymore. I cut out fitness completely. Like for real, we broke up. That was the only way I thought I could manage. Had I read her book earlier, I might have cut myself some slack. And I might have been able to shift my thought process from black and white to gray. Now, I can’t say for sure that it would have helped me then, as I am a firm believer you must be in the right mindset to make a change. Today I am in the right mindset and am open to changing my thinking. Which I was so excited about this book. With school over, I have to opportunity to restructure my choices and I don’t want to repeat the mistakes of the past. Maybe the timing of reading Pick Three now is perfect for me. If you are open to change and rethinking your strategy I urge to you go out and pick of a copy of the book TODAY. You could go tomorrow too. Just don’t wait too long. When you are ready for change, strike while the iron is hot – otherwise, you may never get around to it. While the book focuses on sleep, work, friends, family and fitness you can pick your own categories or define the categories Randi shares in your own terms. Don’t skip the introduction to the book because it has good information. When I saw “Living Lopsided” as a section I immediately thought this book is perfect. I completely identified with it as I have always deemed myself a workaholic. Then to read on that lopsided living was okay all before chapter one. You’ll also love the end if you are a person that wants to take what they learned and apply it. Throughout the book, Randi introduces us to her friends and colleges. They play an important role in the overall story because we can’t be everything. She picked people who illustrated the point she was trying to make. The real-life illustrations help demonstrate the concepts and I enjoyed them. One of my biggest takeaways was that I learned new perspectives from people who aren't like me. What I mean by this is that sometimes it’s hard to understand why everyone doesn’t want to (work, exercise, write, paint…fill in your blank) as much as you do. We all kind of think about others’ lives from our frame of reference and our preferences. The book provides a glimpse into other thought processes and motivators. In the book, we learn about “The Passionista”, “The Eliminator”, “The Superhero”, “The Renovator”, “The Monetizer”, and “The Expert”. We learn about these different roles that we play in the context of the five categories. The role you play can change over time too. The book is an easy fun read and guides you through the process of figuring yourself out. Hope you enjoy the read as much as I did. Would love to hear your thoughts and what your #pickthree week looks like. I am a Work Pasionista. Per the book, this is “a person who chooses to be lopsided toward work makes a choice for themselves, not out of necessity or circumstance, and generally feels they have the support of their friends, family, and/or community in making work a priority.” This one was easy for me to figure out (see my #pickthree week below). My week is a work in progress as I’d like to include family/friends and fitness in there a bit more.